. 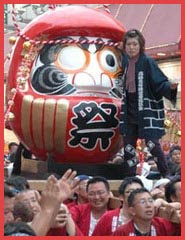 Legends about Mikoshi . is a kigo for all summer. 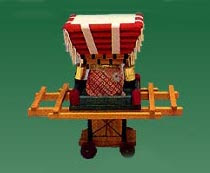 The Chinese characters signify a mountain on a cart. September, on the "Respect for the Aged Day"
"Danjiri Matsuri" (festival) to a Japanese, there is one festival that will come to mind: the violent, exuberant mayhem that takes place every September in Kishiwada, Osaka. The "danjiri" are the large wooden floats, or portable shrines, that are pulled around a pre-set route on the day of the festival. These shrines are kept in storage for a year and are quite beautiful. Prior to the festival, there are ceremonies and prayers. The ornate shrine is taken out and readied; then the fun starts. Where is the Danjiri Festival? The Danjiri Festival is held in Kishiwada City, Osaka. Kishiwada is a working class castle town that was rural until recently. Today it is a suburb south of the city of Osaka, not far from Kansai International Airport. The Danjiri Matsuri dates to the 16th century, and is believed to have its origins in the "Inari Matsuri" that was held in 1703. Like many fall festivals, it is essentially a harvest festival to pray for a good harvest. It was created by the Lord of Kishiwada Castle and has always had a wild side to it. In the past, that could have been said about most festivals in Japan. In the post-war period, however, festivals, like most aspects of Japanese life, have become tamer affairs. The good folk of Danjiri however continue to resist this, and it remains a dangerous festival with several deaths not uncommon each year. The reason for this is that men stand atop the floats as they weave and turn down narrow streets. These men are sometimes thrown off and crushed below. Ueno Tenjin festival 上野天神祭り　held between October 23rd to 25th. 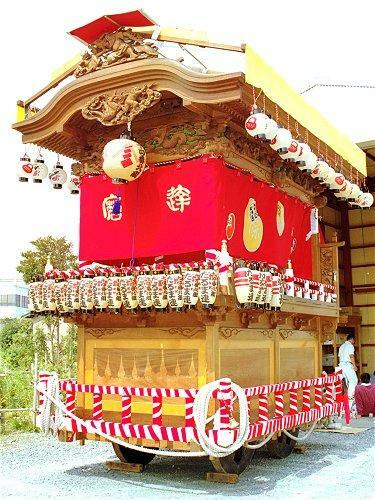 Originally a sacred agricultural ritual, the festival has elaborate portable shrines and demon-costumed revellers parading in the streets, but a main feature is the nine danjiri carted through the city. 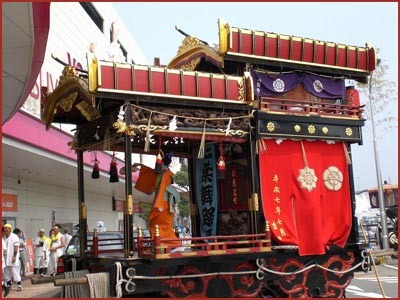 The danjiri is a type of dashi, a traditional Japanese festival float on wheels. 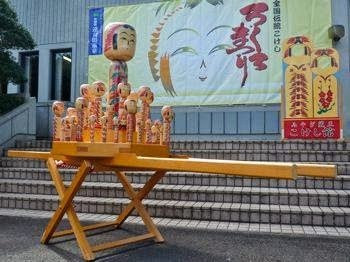 When not being used in the festival, the Iga Ueno Danjiri Museum houses three of these floats for public viewing. The three danjiri floats are encased in a large round glass-walled exhibition room, set about with life-sized models reenacting a festival scene. The floats are mounted on a turntable to make it possible to see them from every angle. As it is, visitors are able to walk and see completely around the showcase from the first floor, as well as partway from above the second.
. . . CLICK here for Photos of the museum!
. . . CLICK here for Photos of the festival! Awaji Island has a profusion of festivals. 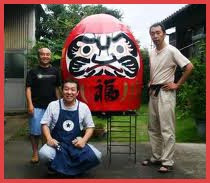 There is said to be a total of 300 danjiri in the greater Awaji area. The main is the futon danjiri 布団だんじり with five layers of red futons. 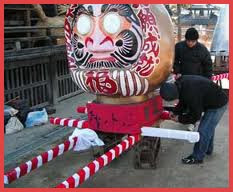 The danjiri are pulled around by shrine parishioners in spring and fall. Created as a group performance based on puppet shows as a sideshow for festivals, the danjiri chorus is also known as jorurikuzushi. The chorus skillfully takes highlights of the story and puts melodies to them. The songs are arranged using danjiri taiko drums and clappers, and there are chorus tsurebushi and solos called puppet katarikomi like storytelling and furi like fork ballad. Katari is placed in the intervals of the chorus and solos. Many chorus groups have sprung up recently and contests are held. 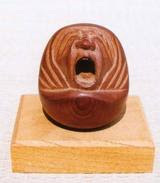 The singing is now considered a folk art of Awaji. It was made by 肥田利一 from 生穂町 and is not made any more. and more details about these futon floats. thrown on the road, forward and sideways, with people standing on them, jumping off in the last moment . . .
Suimu Shrine (水無神社) is located in Kiso, Nagano Prefecture. Record said, it was established in the middle of the 13th century. It has thousand years old Hinoki Trees. Inside of the hall, there are many beautiful large Ema votive tablets. It has been respected by the people of Kiso as the guardian of the valley. 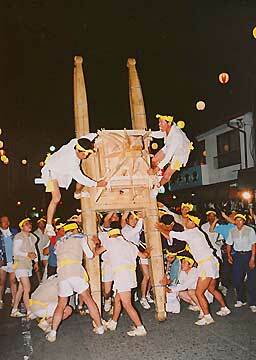 The most famous festival Mikoshimakuri, takes place on July 23.
located in the city of Takayama, Gifu Prefecture, Japan. The kanji for the shrine are also sometimes read as Suimu. The full name is Hida Ichinomiya Minashi Shrine (飛騨一宮水無神社 Hida Ichinomiya Minashi Jinja), as it was once the main shrine of Hida Province.
. . . believed that it was constructed during the reign of Emperor Seiwa during the late-9th century. 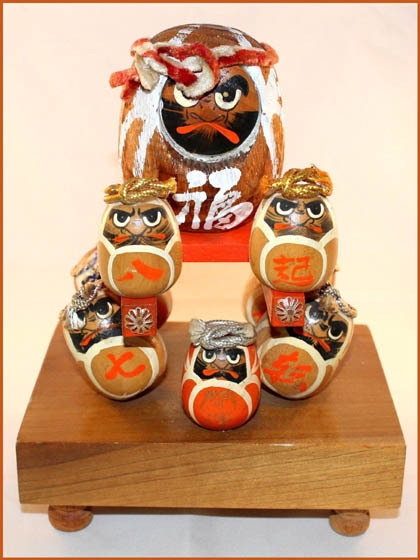 Because of firebombing activities during World War II, Minashi Shrine served as a refuge for Atsuta Shrine's Kusanagi from August 21 to September 19, 1945.
. Kawagoe Daruma Mikoshi 川越だるま神輿 .
. Oita Folk Art - 大分県 . 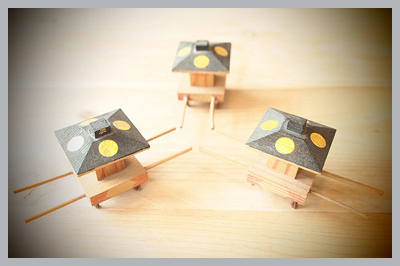 The mikoshi is modelled from the Nakatsu Gion Festival 中津祇園祭り. This toy tradition is no longer alive. This festival has 570 years of tradition and is designated as an intangible folklore cultural asset by Oita prefecture. There will be fireworks on the first day. On the 2nd day (morning parade) and the 3rd day (returning parade) floats called Gionguruma will parade through Fukuzawa street. Many events are held during the festival. There are Floats parading around and dancing all over the city while the festival is held. This hokku was written in the 1st month (February) of 1813, when Issa had returned to his hometown and was preparing to engage in the final strenuous negotiations with his mother-in-law and younger half brother over his inheritance. It seems possible to see the blossom thief as, on one level, an self-ironic image of Issa himself returning to "blossom-steal" his inheritance back from the people who have been keeping it from him. The exclamations might be his ironic imagined representations of the thoughts or whispered remarks of his mother-in-law and the many villagers in his hometown who consider him a greedy, pushy outsider. Even so, as a blossom thief and not an actual thief, Issa expects to be forgiven if he persists. The most immediate image, however, is praise for a very beautiful cherry tree in full bloom. A thief of blossoms -- usually of cherries but sometimes of plums or other blossoms -- means someone who breaks off a blossoming sprig and takes it home. Popular renga grew out of linked verse festivals held under cherry trees in full bloom (hana-no-moto) in the 12th and 13th centuries, when the custom of taking home a sprig of cherry blossoms was tolerated to a certain extent for religious reasons, since the sprig was to believed to be part of the body of the cherry-tree god, and the sprigs were worshiped in people's homes. The custom continued over the centuries. The prince visited with his new lover, the famous woman poet Izumi Shikibu, who is doubtless the greatest blossom of all in the poem, though she is not mentioned directly. The relationship was a bit scandalous, since a short time earlier Izumi Shikibu had been the lover of prince Atsumichi's older half-brother, who suddenly died of the plague, making prince Atsumichi's actions a bit thief-like. Still, Izumi Shikibu is such a superb poet and person that the prince feels sure he will be forgiven. 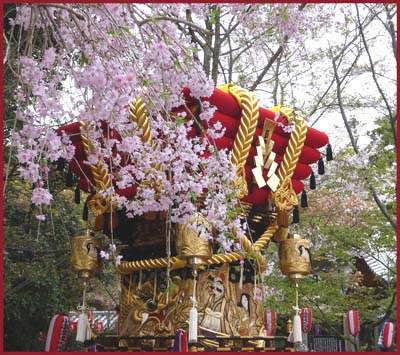 In Issa's hokku, many people in his hometown are probably breaking off sprigs with cherry blossoms on them to take home with them, but Issa focuses on an expensive, decorated palanquin. 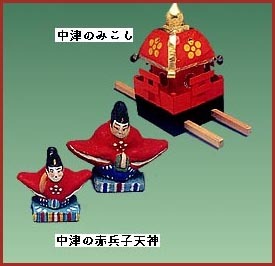 The character Issa uses (輿) is usually read o-mikoshi, the special palanquin of the emperor or a god that is carried on the shoulders of many men, and this is the reading of the editors of Issa's collected works. Issa might also be using the term ironically to refer to any pompously luxurious palanquin. The scholar Maruyama Kazuhiko, however, reads norimono, which is also possible. A norimono was a special luxurious palanquin hanging from a thick, horizontal beam carried by two carriers, one in front and one in back, that had sliding doors on the sides, as opposed to an ordinary palanquin that was open at the sides or often simply a seat hanging from a pole. 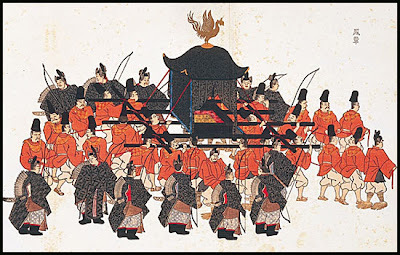 In Issa's time only a few people were allowed to ride in an enclosed palanquin: high-ranking samurai, high-ranking monks, herbal and/or acupuncture doctors, women, children, and commoner males who had paid to get special permission from the authorities. I doubt Issa is referring to the emperor, and unless there is a festival going on, it wouldn't be a palanquin carrying a god. It seems likely that Issa is referring to someone of rank or power who has stopped beneath the tree because of its striking beauty and is breaking off a sprig to carry with him or her, probably as a gift to someone who hasn't been able to see the tree. The tone of the hokku is exclamatory, as if Issa were pointing out a shocking crime in progress. Actually it must be mock-exclamatory, since Issa is at the same time suggesting that this cherry tree is so extremely beautiful that even people who usually ride hidden inside fancy palanquins are willing to get out and act like an ordinary commoner blossom thief. There is no doubt some social satire here, but Issa is also expressing his highest praise for the tree, which is able to make people of all classes humble before it. This is consistent with Issa's usual view that all humans of whatever class are equal in the eyes of Amida.
. Float with Dragon Decoration .
. Matsuyama no mikoshi 松山のみこし mikoshi models .
. Hiroshima Folk Art - 広島県　.
. Hyogo Folk Art - 兵庫県　.
. WKD : mikoshigusa 神輿草（みこしぐさ） mikoshi plant . like mikoshi (portable shrine), but it is set up not a portable shrine but a tall lantern on the frame. On the lantern, beautiful pictures or characters are painted.